TheMediagoon.com: Another day, another horrible Mets pitching experience. Another day, another horrible Mets pitching experience. What the hell is going on with the Mets pitching right now? I know I asked this question yesterday but look at this nonsense. Matz didn’t even get out of the first inning! 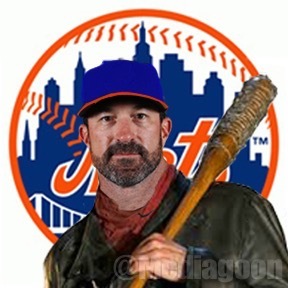 The Mets don’t just have one pitching coach, they have two! One is the damn manager of the team! How are these pitchers with such high caliber talent shitting the bed the way they are? Is it mechanics? Is it the pitching philosophy? Or is it just a bad luck time where everyone is just sucking all at one time? I was lucky enough to miss most of this game because of work yesterday. Why do the two pitching coaches do to remedy this? Anyone have any ideas?